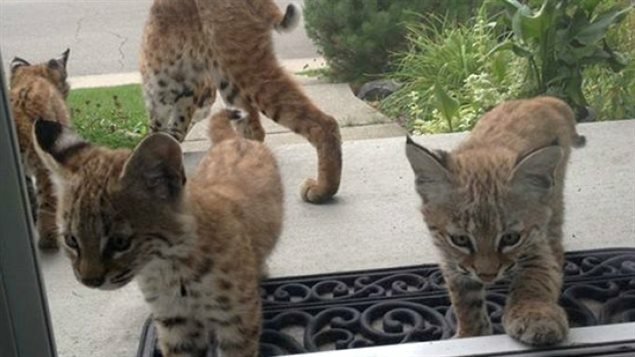 It's not every day a litter of kittens this cute shows up on your doorstep, and it's an encounter one Calgary woman won't soon forget. 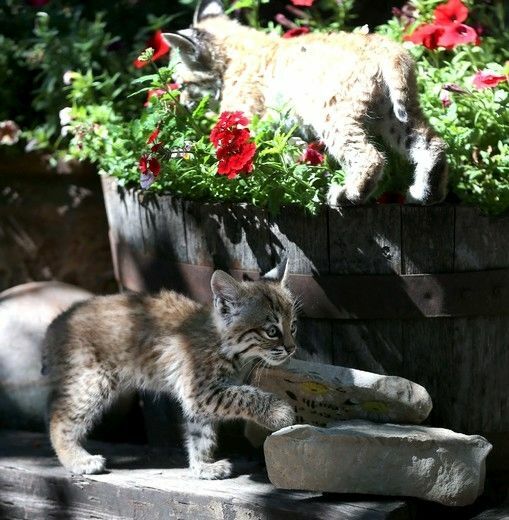 Kathy Reiffenstein got a bit of a shock last Friday when she found a mama bobcat and her kittens checking out the front step of her home on Havenhurst Crescent Southwest. 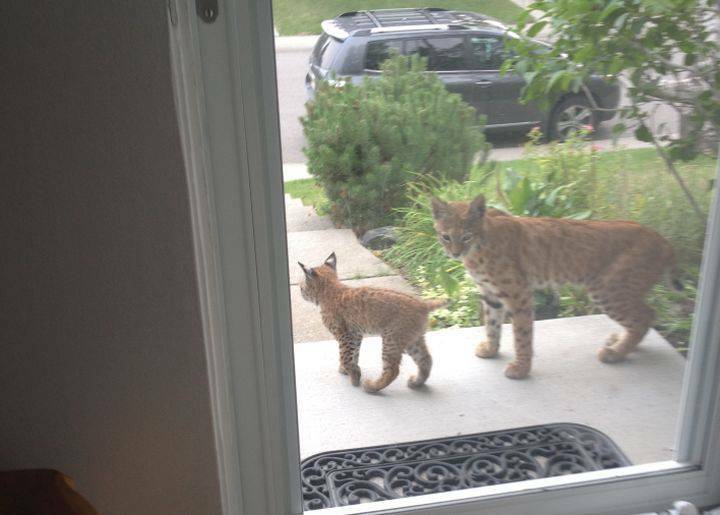 "I just happened to be opening the front door to clean the glass and they were jumping up onto the step," she told the Calgary Sun. 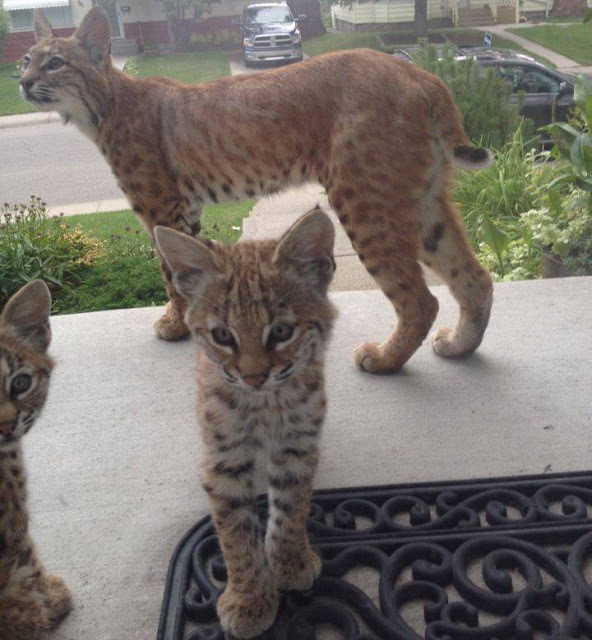 "I saw mom and one kitten right away, then maybe 30 seconds later the other kittens jumped up." 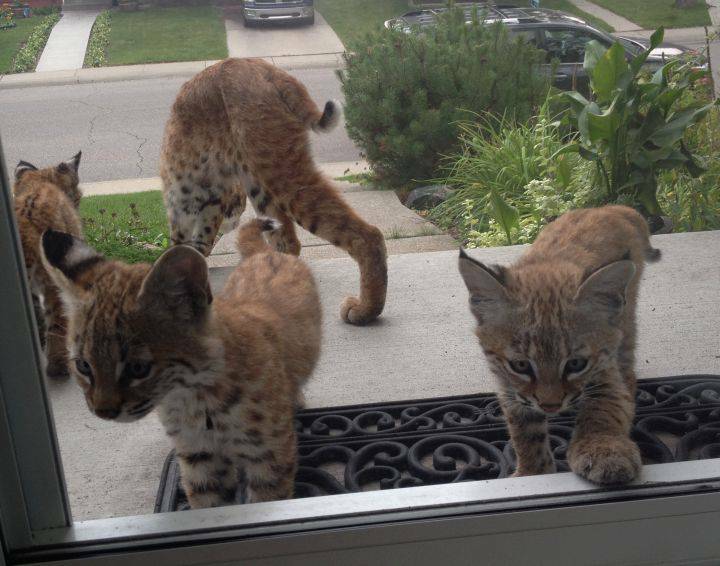 The cats hung around long enough for Reiffenstein to snap a few photos, before they took off down the street. "I have never seen a wildcat before," she told CBC News. "I assumed they were elusive. I was shocked to see them in the city." 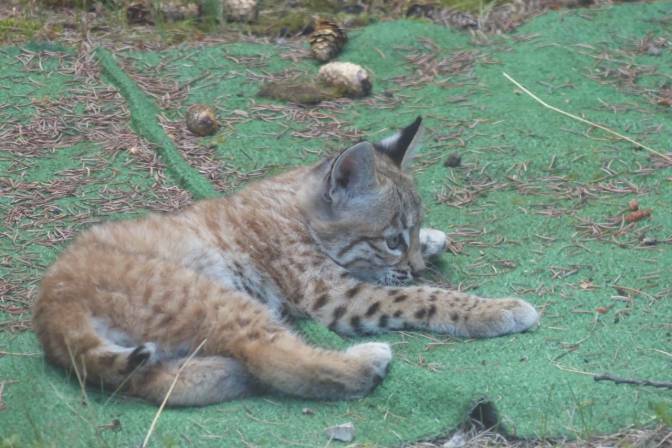 Alberta Fish and Wildlife do not remove bobcats as they are not considered a safety concern. HELLOOO MAY I COME IN? 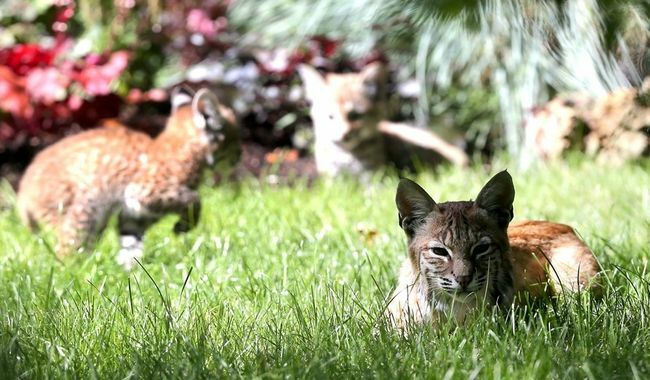 Responses to "Adorable Baby Bobcats Make Surprise Visit To Calgary Home"
I don't understand why people are so shocked when these things happen. The more human's take away from the wild animals that lived in the area first, the more those animals are going to start coming around looking for food. It is OUR fault that Bears, mountain lions, coyotes, foxes, bob cats and other animals are coming closer to us. We've taken away their food source. Instead of punishing the animals for doing what comes natural, maybe we should start trying to understand WHY they're coming closer and sometimes attacking. A mother will attack to protect their babies. DO NOT PUNISH that animal for doing what ANY mother or animal knows instinctively to do. 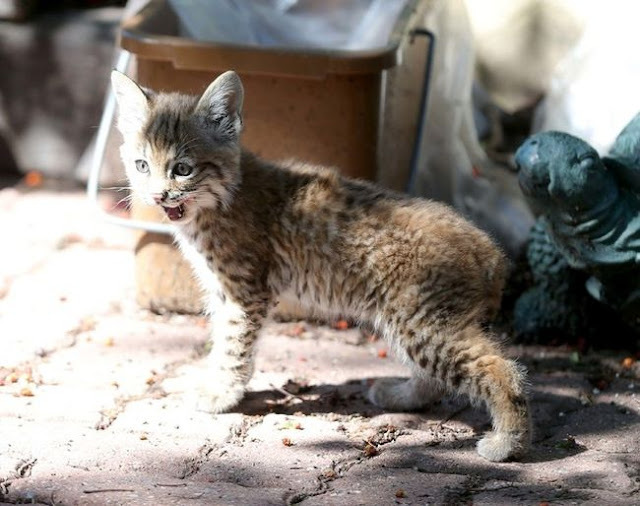 No one should be alarmed about a Bobcat coming around your home. When I was growing up we had them around all of the time and we were NEVER threatened by one. 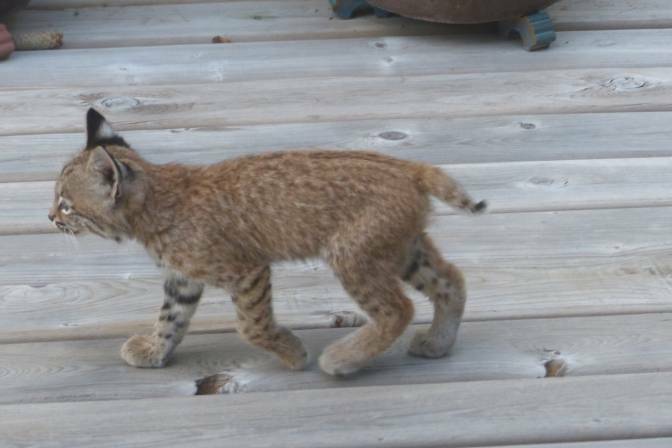 One of the smaller males mated with a bit black mama cat and she had a couple of kittens. However, the wild streak was still in their veins. They were so pretty though. those cat in the vid are no bigger than a maincoon cat, And that lady acting like she saw a tiger, seriously Dog kill more people than tiger do in a year !!!! We are taking away their territories and also the food sources for them. Now they try to find their food in our garbage. She may have been taking her kittens on a learning tour of their neighbourhood. These are humans, some are nice and some are not. don't automatically trust them. I would be over the moon if I saw them in my garden. Where are these animals supposed to go when you steal their territory. This is a subject I worry about a lot. I'm concerned about the animals, not the humans who are gready land grabbers. Live and let live. there's a nice story! thank you! They are welcome around my house any time. Might make the raccoons and opossums think twice about stealing the cat food. They are such a beautiful animal. And seeing a momma & babies is extra beautiful. I hope they will be able to live a long & healthy life. Thank you for sharing these beautiful cats. Lucky yours. ours are far away. I wish it would happen to me! I'd feed them and encourage them to come round all the time. The mere fact that she trusted the neighborhood to bring them around in broad daylight says a lot for your neighborhood. Also, you must have a healthy pipulation of moles, voles, mice & rats for them to eat, & she is teaching them what to forage, & what not to eat, like cans of cat food that might be poisoned. So seeing these shadow vermin killers is a good thing. Can I adopt one? My number is 337-277-0628..I would love one.